We know that starting a Facebook Page is not that easy as it seems. Even though we have quality content, most of us struggle to get likes on their pages. Only sharing our page on timeline don’t help. The way around it is that we can invite the people from our friend list to like our page and probably that’s why you are looking for a script to invite all friends to the facebook page. There is invite button provided on a Facebook page through which we have to invite our friends one by one. However, if you have a huge friend list then manually asking all of them will consume lots of your time. But first of all, I am going to 9 simple tips to ensure to optimize your Facebook Page. No matter how much quality content you publish on your Facebook page. The First thing that catches the user attention is the name of the page. Make sure to use a name that can be understood by the users. Keep it clean and straightforward. Custom URL helps your daily visitors to remember the URL to access it frequently. Don’t make it any complex. When a Facebook user is exploring new pages, the first thing that catches their attention is the details about the page and a little information about what it is about. More detailed About section is, the more likely to gain likes easily. You just can’t post anytime you want. This is not how it is supposed to be. You have to analyze your fans behavior that when they are most likely to be online and other factors. First of all, try posting at different times and then check at which time interval you got the most reach and engagement. And then try to schedule and publish your posts at that interval of time. This also applies while inviting your friends to like your facebook page. Along the time, we have found that a post with an image has far more reach than a simple text post with a link to it. This is probably because photos catch our attention far soon than a standard text. You can try this step and let us know in the comment section! About a few months ago, Facebook added a Call to Action button which you can use for various purpose like feedback, app promotion, learn more, etc. By responding to the user’s message faster, a badge will turn on when a user visits your Facebook page that will tell them that you are very quick to reply when asked something. Another thing that will attract the users! Tip: You can also ask your friends to invite their friends to your page. Let’s say you have some post that you want to promote more than any other. Then you can simply pin that post to the top. So that whenever someone visits your page it will appear on the top of all published posts. There are various apps available that will help you by adding tabs to your page. Some tabs like shopping, services, etc. are built in, and you can use these to promote your business right on your Facebook Page. Now, I am going to share a code which will help to invite all friends to Facebook Page in Single Click. This trick is very helpful in generating more Facebook Likes for the page from our friend circle. You can also add all friends to the facebook group. I have also created a video tutorial for it which is given below. You can also check out the written tutorial on this video. Activate the extension and head over to your facebook page. You will see a little tick icon near the bookmark star. This means that extension is working fine. Now on your page, select invite friends option. A popup will show with all of your friends in it. Then click the icon of the extension. This will begin the process of inviting all of your friends to your facebook page. Copy the code given below or open this link http://pastebin.com/XsRRhVPG. Click Invite Friends and Scroll to the bottom of that list. (Use Page Down to Scroll Fast). This is a very important step. Press F12 to open developer console. Paste code there and hit enter. Within few minutes all of your friends will be invited to that page. Update: Users are getting blocked due to inviting lots of people in a single go. Facebook considers this fishy and can block your account from inviting friends to like your facebook page for a specific time. So we recommend you to only invite 50 friends per day to stay safe. Here is the updated code to use instead of the one that is given above. 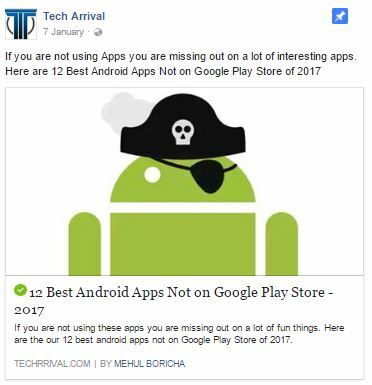 There may be some cases like you boosted a post using Facebook advertisement. There you will get an opportunity to invite the people who have liked your post on your page. In most cases, this results in lots of increase in likes. Also larger the list harder and time-consuming it is to invite everyone manually. Thank you for reading this post and keep connected to Tech Arrival to continue enjoying excellent posts. Share your views on this post in the comment section below. If you still have any query, throw it in the comment section. Blogger must need a facebook page for their blog to promote post. To reach the post to others, we need some sort of audience, without readers we can’t get engaged and can’t get enough traffic. If we get traffic we can earn money. For that, we have to invite more friends to our page. It might be useful for the newbie bloggers to promote their blog. Thanks for share. Nice video tutor. This is a nice site for the blogger which gives valuable information to the blogger to run their blogs. essay writing services reviews suggests the bloggers to follow this site. Everything is very open with a really clear clarification of the challenges. It was really informative. Your site is very useful. Thanks for sharing!